New Delhi, Mar 16 : Taking a leaf out of Prime Minister Narendra Modi’s book, the Ministry of DoNER is planning to launch a ‘Make in Northeast’ initiative. 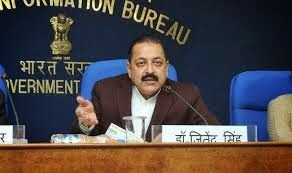 Addressing the first meeting of the Parliamentary Consultative Committee attached to his Ministry, DoNER Minister Dr Jitendra Singh informed the members that the ministry will take up the ‘Make in North-East’ project in the lines of the ‘Make in India’ campaign announced by the Prime Minister. The consultative committee discussed the issues of promotion of tourism, development of connectivity and other infrastructure projects in the region. The meeting was attended by Union Ministers of State, Sarbananda Sonowal and Kiren Rijiju. Dr Singh said that the ministry is also arranging a Mega Festival in Delhi by involving NEC and the North Eastern States shortly. He also informed the members that the hostel facilities for NE students in Delhi are also being increased by constructing two more new hostels for them. There is also a proposal to set up a study centre in the Jawaharlal Nehru University for the students from the region. The ministry has also decided to appoint boxing champion MC Mary Kom as the brand ambassador of the North-East, Dr Singh told newsmen. Meanwhile, the Minister of State for Sports and Youth Affairs, Sarbananda Sonowal, told the meeting that the main concern of the States is connectivity and infrastructure development. He, however, suggested that the projects in the region should be taken up as per the requirements of the States and should not be decided unilaterally. The Minister of State for Home Affairs, Kiren Rijiju, highlighting the issue of organic farming in the region said that his ministry is implementing the Bezbaruah Committee report, which has also recommended the setting up of a world-class convention centre in Delhi for the North-Eastern States. He mentioned that the problems of the power sector, tourism and civil aviation are required to be coordinated with the concerned ministries by the Ministry of DoNER. The members highlighted the issues of the region, ranging from tourism, power, roads, civil aviation, organic farming, horticulture development, processing and packaging of fruits.